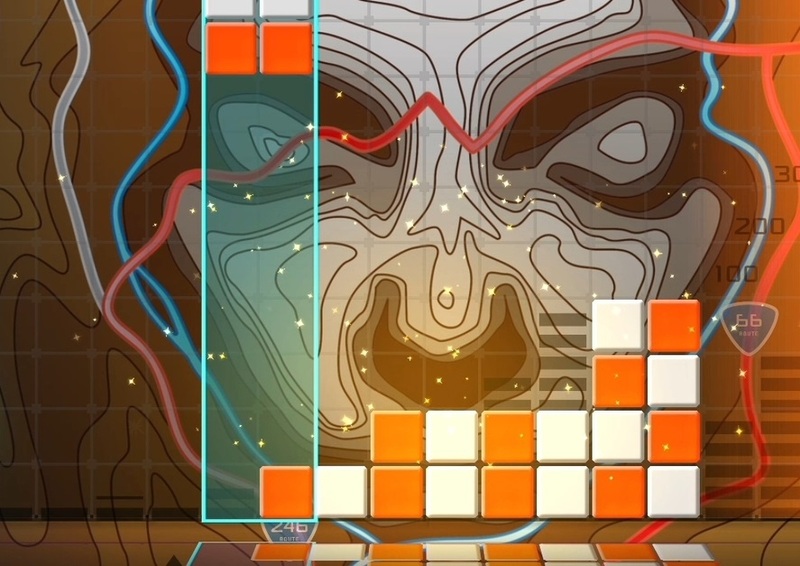 Related reading: Here's a review of another Lumines game, for people with iPhones! I've had this song on loop, buried deep in my brain, all week. Blame Lumines, the most infectiously catchy puzzler ever released, now available on new platforms so that you don't need to go digging through the boxes of "old stuff" just to play. 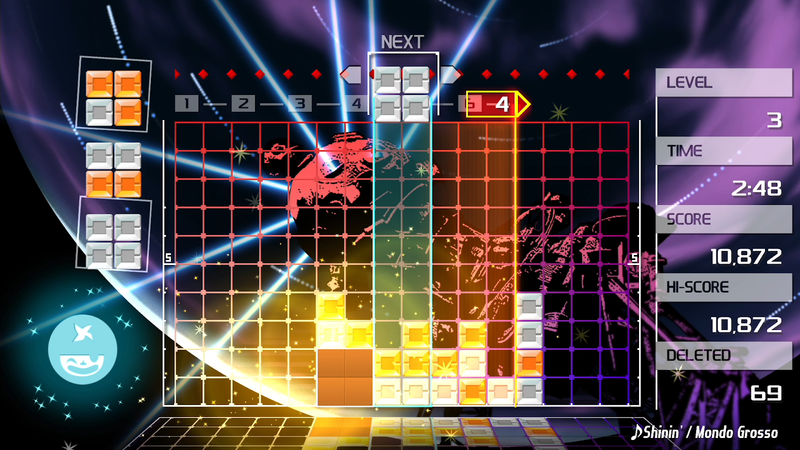 Lumines was released for the first time back in 2004 on the PSP, and that timing made it my university game. It was perfect for a university game, because it bills itself as a "fusion of colour and music", and combined with certain substances, that made for one beautiful, beautiful trip. Fast forward fourteen years, and of all the games in the world that didn't really need a "HD Remaster", Lumines is right up there, because the game was always about the minimalism. All that really needed to happen was to stick the original game on our new toys. Thankfully, that's basically what has happened, and while I might be sober these days, I can't think of anything I'm happier to have sitting on my Switch than this. 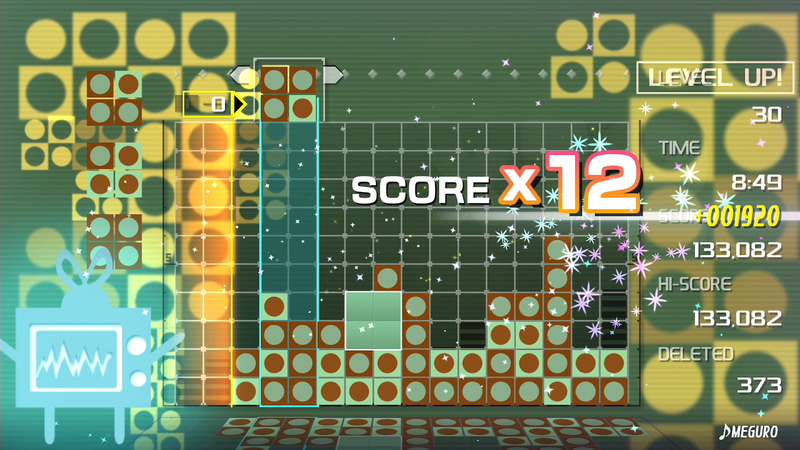 Lumines is difficult to describe in words, but incredibly easy to learn how to play. On the most basic level it's a block falling puzzle game, a little like Tetris. Square blocks made up of two colours descend down the screen, and your job is to arrange them to create squares of the same colour at the bottom. Let the blocks get to the top of the screen, and it's game over. Where this one is different to Tetris is that the blocks are actually removed in time with the soundtrack. There's a beats per minute (BPM) bar that constantly scrolls from left to right at a speed related to the backing track at that point in time. If you've matched up four blocks of the same colour into a square, they will start to glow, and the bar will remove them only as it passes through them, causing everything above to then trickle down. That's how you can set up combos. 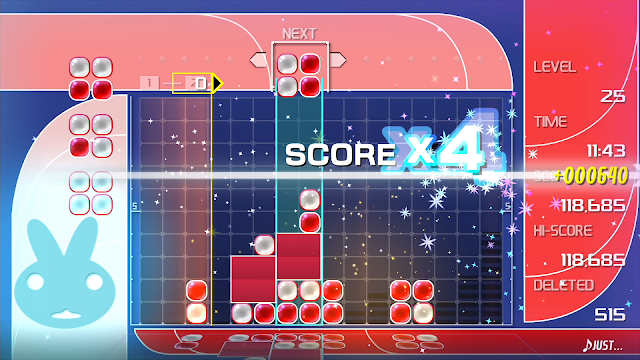 Being good at Lumines requires absolute precision and strategy in terms of where to place the blocks, as well as a mastery over timing in order to set up large chains, so that the BPM marker can remove large numbers of blocks in each "sweep." That's how you get really good score multipliers in Lumines - have a number of sequences in a row where the market removes at least four squares of blocks. If all of that is difficult to visualise, don't worry. It's such an abstract game that it only really starts to make sense during play. Indeed, the developers were so confident that players would "get it" that there isn't much more than a couple of static slides that provide the game's "tutorial." If that sounds hostile to new players, I must emphasise this; it'll take you one, perhaps two attempts to understand with perfect clarity what you need to do to play. Mastering it is a completely different matter, but you'll understand it. With mastery, Lumines becomes fascinating in that it stops being a puzzle game and transitions to feeling - and behaving - just like a rhythm game. You'll find yourself maneuvering and dropping blocks in time with the beat (accompanied by an endless rumbling of the rumble packs so that your body will also literally feel the beat). Your feet will be tapping along. The explosion of colour and energy that comes from playing well will also accompany the beat completely, meaning that you're putting your own rhythmic spin to the music, and adding to it in a way that makes you feel like you're part of the performance. With bold, dynamic, and bright colours for the blocks (which transition between visual styles with each new music track), the end effect is nothing short of mesmerising. Lumines is a surprisingly demanding game on your time - to unlock each track for use in "free play" you have to first reach the track in the main mode, and getting through it all requires a solid half hour of solid concentration (it might be even longer than that, as I tend to lose time when I'm playing Lumines). But it never feels like a grind. It can be draining, for sure; there's so much energy and verve that it's hard to keep the energy levels up to meet the bar Lumines sets. But it's mesmerising, slick, stylish, and so stunningly beautiful. There a few dud tracks, of course. Give me a single example of a rhythm game that doesn't have some. 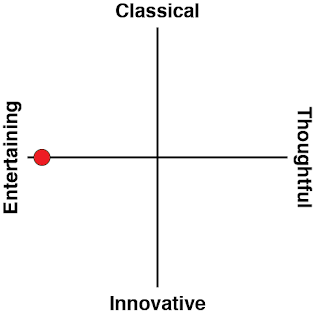 I wouldn't even claim the Hatsune Miku series avoids some dud tracks. 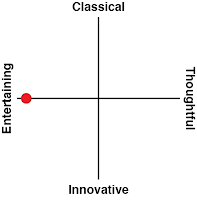 That is in part why I'm not a huge fan of rhythm games that force you to play the tracks that you don't like. It's why I do prefer the free mode where you can use tracks that you've already unlocked in whatever order you like. In fact, Lumines' one Achilles heel is that it does force you to play modes like its multiplayer thing in order to unlock everything. The multiplayer mode isn't terrible, but if I wanted to play a competitive puzzle game, I'd break out Puyo Puyo Tetris. Lumines is at its best when it's pure immersion, no frills. Throw on a really good headset, turn the volume right up, load up a playlist of your favourite music, and melt deep into the beats, thudding rhythm, and hypnotic colours. Lumines is a puzzle game, but the action becomes so driven by feeling and rhythm that it's not really fair to call it something so simple; at it's best Lumines is a game you don't think about. It's a game you feel. And Lumines is so perfectly good at that all the developers needed to do with Lumines Remastered is stick the exact same game on Nintendo Switch. Some largely inconsequential HD features and rumble features aside, that's exactly what has happened. And it's the perfect experience for the console.